On sale in Tackle shops now - in Newsagents Thursday 9 October. Contents include how Mike and Todd caught three fish in Lake Crescent that weighed 30 pounds, plus heaps more as below. 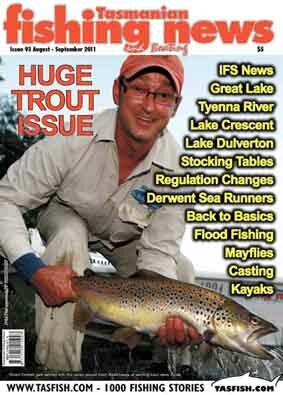 TFBN August 2011 - OUT NOW ! Wow, what an issue. 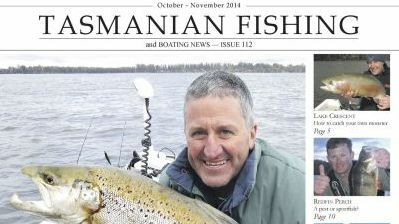 This is the biggest issue of Tasmanian Fishing and Boating News we have done. I don’t know how many words are in here, but it must be a lot. I would particularly like to thanks the Inland Fisheries Service for their contribution to this issue. 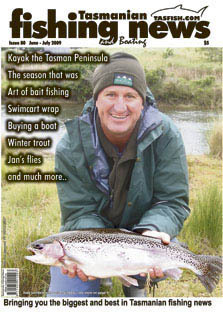 For fly fishers in Tasmania, October and November offers the greatest range of sight fishing opportunities for the season. 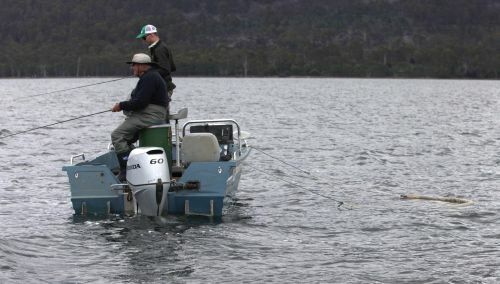 Tailing trout at Little Pine Lagoon, mayflies on the lowland rivers, sea-runners on the wild West Coast: just some of the classic Tasmanian sight fishing events found in the sometimes wild and windy, but always dependable October to November period. Tailing trout Leading on from early season action in September, tailing trout are the fly fishing highlight of October on the Central Plateau. The Nineteen Lagoons, on the edge of the Western Lakes, plays host to the most opportunities to chase tailing trout. Popular waters include the floodplains associated with lakes Augusta and Ada, though the peak events usually occur on the lagoons and tarns along the Little Pine River system, continuing downstream beyond the Nineteen Lagoons and onto Lake Fergus and the more accessible Little Pine Lagoon. Further down the plateau, and more action can be found in Pine Tier and Bronte lagoons. Feeding on caddis, snails, isopods and amphipods in shallow water, with heads grubbing along the bottom and tails waving in the air, hunting tailing trout can be very exciting. Both dry flies and wet flies can be successful, but persistence and patience are the key to catching tailing or mooching shallow water trout. Great fly patterns to try include Woolly Bugger variations, stick caddis imitations, snail patterns, Black Spinner dry flies and of course, the Red Tag. My own personal favourites include the Woolly Caddis, Simon’s Snail, MkII Woolly Bugger, Black Spinner and the Black and Peacock as described in my In Season Tasmania or Fly Cards books. The 2010-11 angling season starts on Saturday 7 August, with the traditional opening of brown trout waters. Rainbow waters will remain closed until Saturday 2 October this year. You require a current angling licence to fish at any open inland water in Tasmania (including farm dams on private property), except at a registered private fishery where you generally pay to fish. You can purchase or renew an angling licence by visiting a licence agent (at major tackle stores or any Service Tasmania shop). Licences can also be purchased or renewed online at www.ifs.tas.gov.au. Angling licences range in price from a full season adult licence at $66.50 to a short term weekend licence for $20. 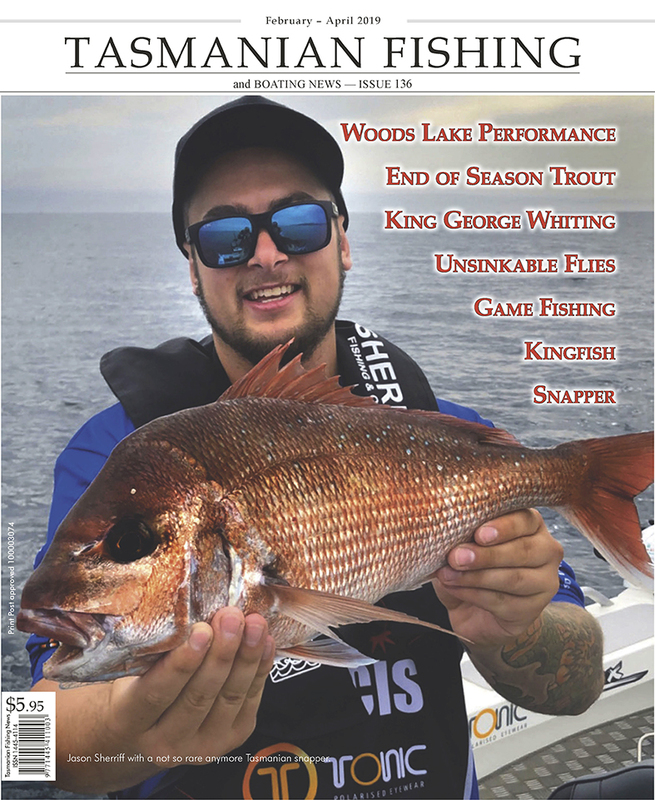 The full season licence offers anglers the best value for money; being a 12 month licence with the opportunity to fish every day of the year; and with significant discounts for juniors (80% less at $12.00), pensioners (45% less at $36.50) and seniors (25% off at $53.00). Other benefits include the convenience of being mailed a renewal form each year before the start of the season, which contains a durable licence card. The Service also targets full season licence holders with information and special offers such as the automatic entry into competitions to win prizes. This year, we are repeating the offer of free entry to the Salmon Ponds on presentation of a full season licence card and also a Voucher, mailed out with the renewal notice, for a free weekend licence to ‘Take a Mate Fishing’. Issue 80 went on sale last week. Plenty of great winter reading. 14 years and still going strong. Getting heaps of back issue stories online now, so check out the back issues on the top right of your screen.